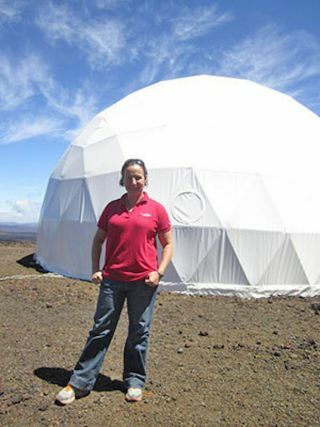 Principal Investigator Kim Binstead poses in front of the HI-SEAS habitat on Hawaii island. Six scientists will spend a year there simulating exploration of Mars. "We hope that this upcoming mission will build on our current understanding of the social and psychological factors involved in long duration space exploration and give NASA solid data on how best to select and support a flight crew that will work cohesively as a team while in space," Binsted said. To ensure that crewmember performance is at its highest in preparation for an eventual Mars mission, each person will be monitored by several forms of technology. Researchers will use cameras, body movement trackers, electronic surveys and other tools to track cognitive and social factors that could affect team performance. The year-long mission follows two NASA-funded missions of shorter duration in the past two years. The first mission was four months long and the second, which wrapped up in June, lasted eight months. - Sheyna Gifford, a researcher in astrophysics, neuroscience and psychology. - Tristan Bassingthwaighte, a doctor of architecture candidate at UH Manoa. - Carmel Johnston, a soil scientist from Whitefish, Montana. - Andrzej Stewart, a console controller for several NASA missions, including Mars Odyssey and the Spitzer Space Telescope. - Cyprien Verseux, a doctoral student in astrobiology at the University of Rome. - Christiane Heinicke, a German physicist and engineer.